SNL Review: " Tina Fey and Amy Poehler/Bruce Springsteen & The E Street Band "
Should auld acquaintance be forgot, and never brought to mind? Should auld acquaintance be forgot, and days o’ lang syne! 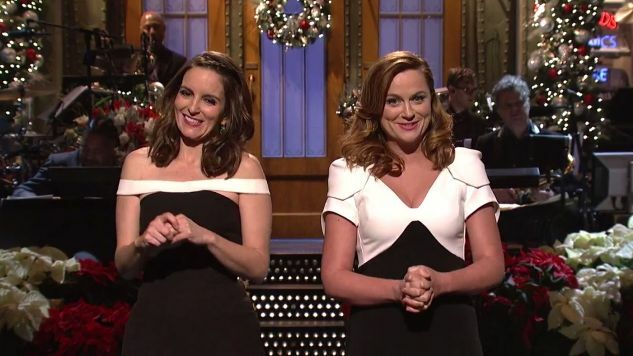 At year’s end, it is old acquaintances Tina Fey and Amy Poehler as guest hosts (and Bruce Springsteen & The E Street Band as musical guests) that return Saturday Night Live to some semblance of the good old days. This is the perfect show fans have longed for. Which is not to say that the episode is the funniest of all time or even the best in years. It is, quite simply, a case-in-point for understanding Executive Producer Lorne Michael’s vision for SNL. Every box is checked and the execution is flawless. As such, it is good for us to recognize and celebrate this rare moment of vital Saturday Night life. Fey and Poehler are co-starring in a new movie (written by longtime SNL staff writer Paula Pell). This, ostensibly, is the reason for their booking as co-guest hosts, though both have successfully hosted solo in the past. It is a big win for Saturday Night Live. Michaels likes his show to be movie star-studded, and whereas most movie stars are a bit thrown by the show’s breakneck creative process, movie stars Fey and Poehler cut their teeth on it. They know the drill and hit the ground running at full speed. Fey and Poehler are instantly comfortable, making it all look so easy in a brilliantly conceived and written opening monologue—a variety show musical number that pits sacred Christmas against secular Christmas. Our co-hosts are so surefooted here, so confident in the delivery of every line and lyric, but not in a showy or braggy way. Saturday Night Live stagecraft is in their bones. Still, there’s more happening here than just comfort and confidence. Fey and Poehler keep the energy sky high for the entire show, which is no small task as sustaining performance energy has been a challenge all season for SNL. Fey and Poehler give what is nothing short of a master class in how to play the 8H stage. Current cast members and future guest hosts would be wise to study this episode for years to come. Game show parody “Meet Your Second Wife” may be the finest sketch of SNL’s 41st season. Fey and Poehler are cheery game show hosts (Fey as herself) that introduce happily married men to the children who will grow up to be their second wives. This is smart, acerbic satire that works so well it begs the question: why aren’t sketches like this making it to air when Fey and Poehler aren’t guest hosting? Is Saturday Night Live writing up to Fey and Poehler, or did Fey and Poehler curate a different kind of sketch from this week’s table read? Tina and Amy appear in every sketch save “GOP Debate Cold Open” and pre-tape “Hoverboards,” which has the cumulative effect of crowding out most current cast members. While announcer/alum Darrell Hammond locks down an official SNL Donald Trump impersonation in the cold open and Maya Rudolph helps bring back an old standby in “Bronx Beat 2015,” only Kenan Thompson (and maybe Taran Killam) gets enough air time to break a sweat. Kate McKinnon shines early as Hillary Clinton circa 2015 meeting Poehler’s Hillary Clinton circa 2008 and Fey’s Sarah Palin, but for the most part this is Tina and Amy’s showcase. Which, again, is how Michaels likes his show to work: big, breakout stars doing the heavy lifting. Bruce Springsteen & The E Street Band are as good at being Saturday Night Live musical guests as Fey and Poehler are at guest hosting. Springsteen and his band understand that being great on SNL means playing to the room like it’s an arena, while making nice to the studio cameras. The Boss gives us “Meet Me In the City,” a new-old song from The River recording sessions, and “The Ties That Bind” from the same 1980 double album. And he comes back at the end for crowd pleaser “Santa Claus Is Coming to Town,” a bring-down-the-house showpiece that is marred only by a completely ridiculous appearance by Paul McCartney as backup singer and sleigh bell jingler. Ah, but there’s the rub. This wouldn’t be full Lorne Michaels perfection without a cloying, celebrity overreach. So again, it’s dumb…and perfect. So there it is. The holidays came early for Saturday Night Live this year. By doing what they do best really well, they knock it out of the park. SNL returns January 16 with Adam Driver. Chris White writes and directs independent feature films. His latest, an award-winning showbiz comedy about looking for Bill Murray, is called Cinema Purgatorio . Follow Chris on Twitter.